YouTube Top Comments is a Google Chrome extension that shows (site embedded) video’s Description, Rating and Top Comments on any website. Gives more relevant information about the video clip. Try different DISPLAY MODES from extension settings to suit your liking. Safari : will work on it. Allows selectively disabling YouTube Comments on particular websites. Shows video’s Top Comments, Rating and Description in compact form under video clip. You don’t have to go to YouTube site to read more about clip as the information is made available right where the clip is embedded. Try different display modes from Settings (click Youtube icon in address bar). 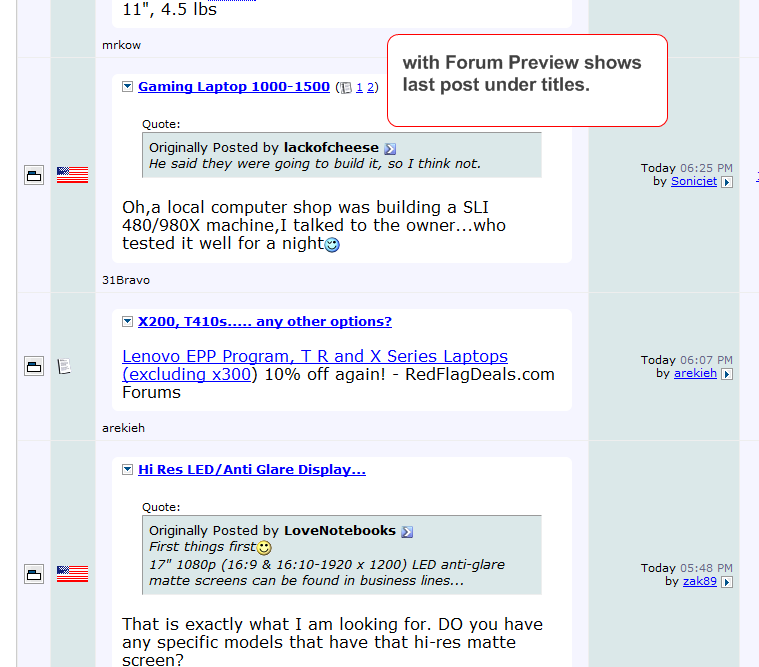 I originally created this feature first for my Forum Preview extension. After some use realized that it is useful and is better as separate extension. Top Comments For YouTube – chrome extension. Shows description and comments on all website. 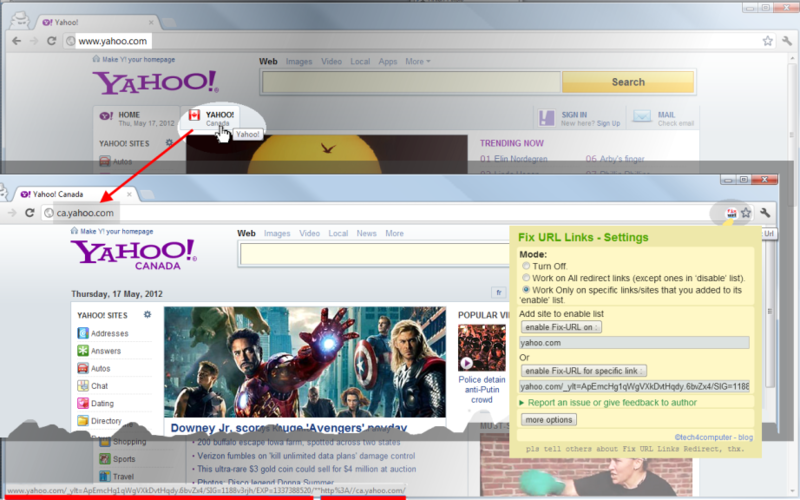 Fix Url Links Redirect Google Chrome extension (1) removes the URL link redirect and takes you direct to destination. Remove the middle man and tracking. Second feature is (2) remove link Referrer. Work on All redirect links (except ones in ‘disable’ list). OR work Only on specific links/sites that you added to its ‘enable’ list. This is default setting. Try both methods and see which suites you. You train it by adding links to it as you use it. Fixes URL links redirect. Allows selectively disabling/enabling fix URL redirect on particular websites. Removes link ‘Referrer‘. Its a totally separate feature than fix redirect. It can be disabled in extension Options. Removes middle-man / tracking as side effect. If webpage didn’t behaved or loaded as expected and there is a fix-url icon in Address Bar then click that icon and add the suggested URL to the disable list. As you use the extension more the need to add sites to disable list will get less. Manage list of URLs for which this extension is disabled in extension Options. Dark/black icon in Address Bar => extension is disabled. Dull Brownish icon in Address Bar => extension detects redirect but it didn’t fix as site is not in its list. Click on icon to add/remove site. Red-black icon in Address Bar => extension fixed redirect link. When visiting a webpage, the referrer or referring page is the URL of the previous webpage from which a link was followed. Most web servers maintain logs of all traffic, and record the HTTP referer sent by the web browser for each request. Technically the effect of this extension’s ‘remove Referrer’ feature is similar to attribute rel=’noreferrer‘. For example, if you are looking at BBC.com website and in there you click a link to another website say cocacola.com. Now cocacola site will know that you were viewing BBC website. With this extensions ‘remove referrer’ feature the cocacola company won’t know what website you were viewing. Note (Sept, 2013), Yahoo changed its website design. So the scenario shown below in screenshot no longer works on Yahoo. Later on, I will update screenshot to a site where you can test the extension. 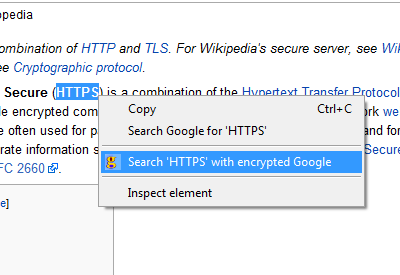 A simple Google Chrome extension that lets you search highlighted word with encrypted (secure) Google instead of the classic open google. This way its hard for the man in the middle to see your search. Adds a right-click context menu item. With this method you might loose the search suggestions. 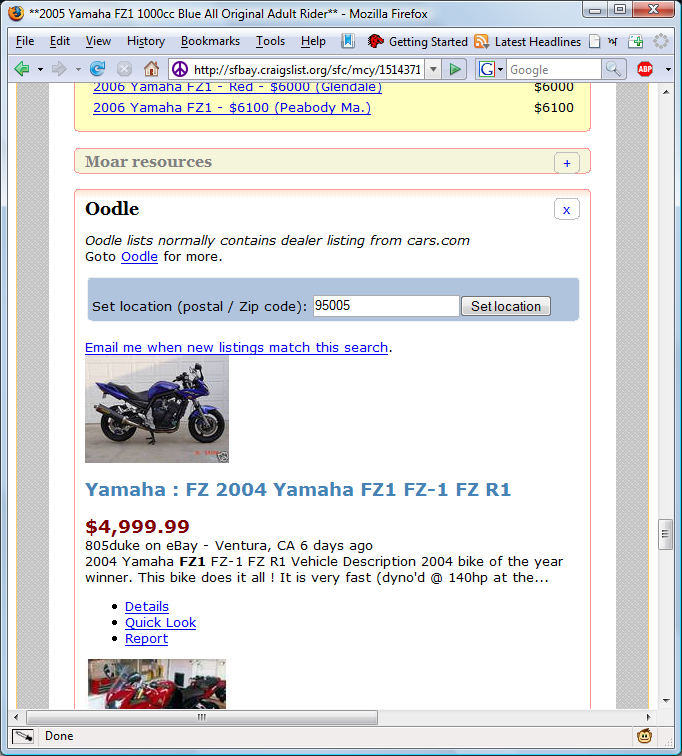 Craigslist Peek is a Google Chrome and Firefox Extension for Craigslist, kijiji (US), eBay Classifieds, 58 同城 and Facebook Marketplace listings page. Craigslist Peek shows Post and Image Preview. Safari Extension version coming soon. Both Firefox and Google Chrome versions works in Mac, use them for the time being. 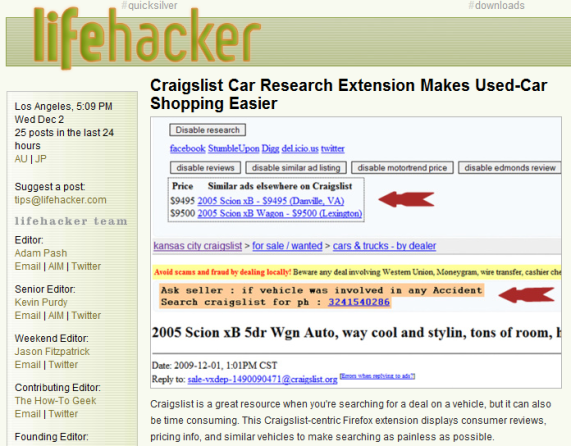 I created this from my other Craigslist extension for cars section. And hence Suggestions feature in the cars and motorcycle section. Multiple Cities listing. Widens your search area to include neighboring cities. Auto refresh. Shows new posts on top. New post counter. I removed some features to keep it simple and practical. Later on I might add some features for particular categories of Craigslist. Seems new changes in Facebook Marketplace are identical to how I was changing Facebook Marketplace with this extension, so now disabled other stuff and only doing image preview in this. 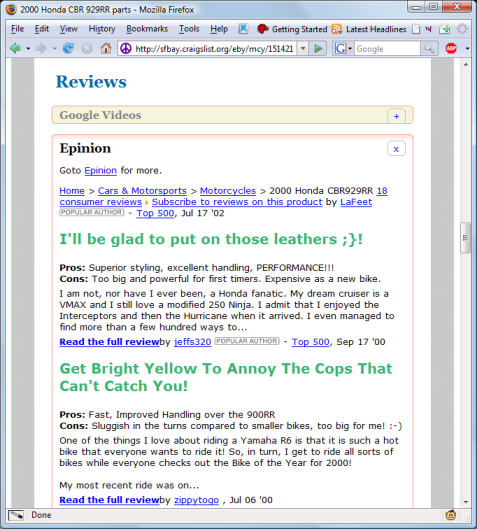 It looks like some sites (Google News : http://news.google.com and others) have now adopted similar concept to what I been doing in Craigslist Peek and Forum Preview. In these when a person clicks on a Post, it opens in a new-browser-tab. This saves you from clicking Back and re-loading the listing after viewing Post. Enable / disable multiple cities or auto-refresh in Settings according to your need. Fast computer with fast internet connection. 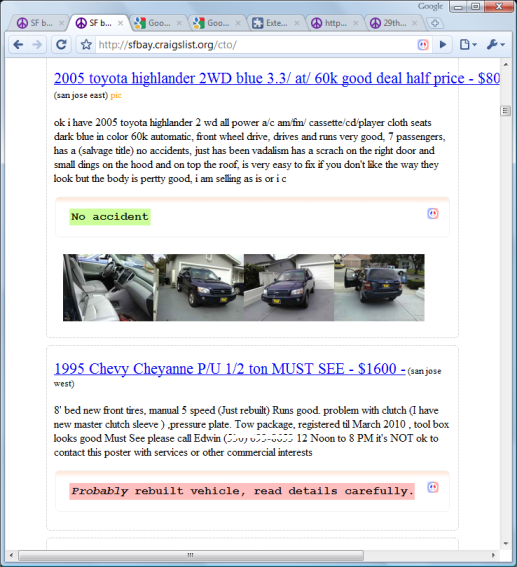 showing craigslist ad excerpt, thumbnail and suggestions. Settings of craigslist-peek extension. Lets you configure preview image and text. * New posts counter on top. * Support for eBay’s Kijiji to eBayClassifieds change. * Restructured code a bit. * Now it allows to show multiple cities listing. * Added auto refresh of listing every few minutes. * few new options in Settings screen. * Fixed one odd case where it wasn’t working. 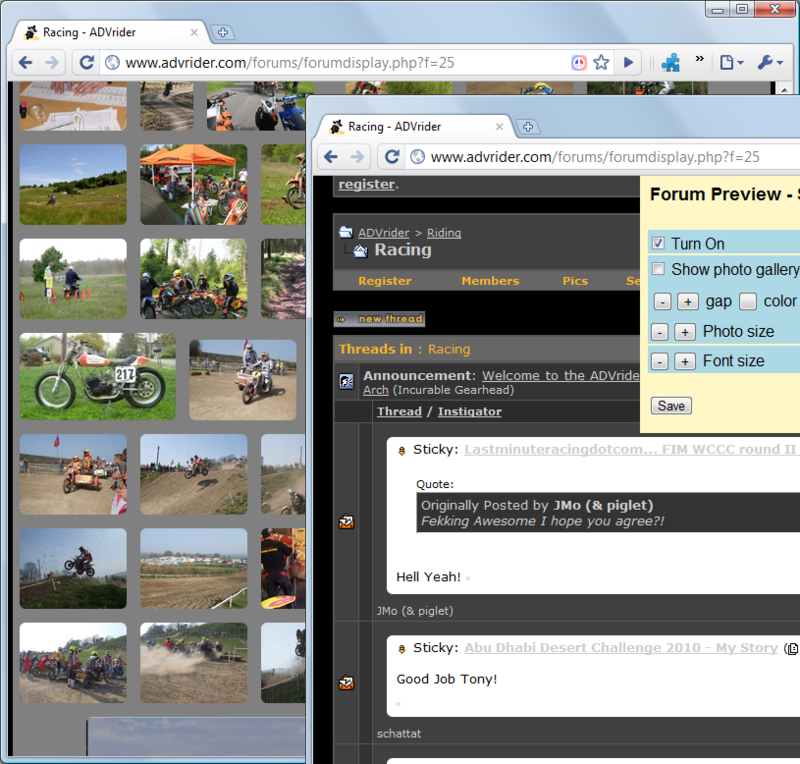 * Added Suggestions (for Cars/motorcycle section only) feature to Gallery mode also. It adds red border around images of ad that the buyer might want to be extra careful about. * Fixed couple of bugs regarding default settings and image spacing in gallery mode. * Just checked some similar ff extensions and found that there Settings screen is almost similar to mine. * Fixed couple of bugs regarding click in gallery mode. 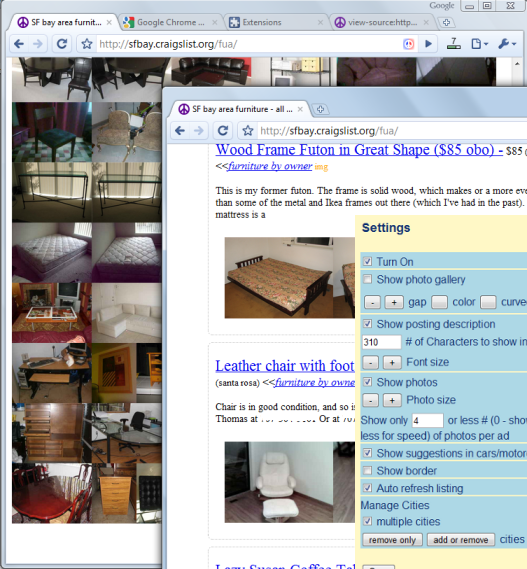 * Now image preview works on Kijiji listings also. 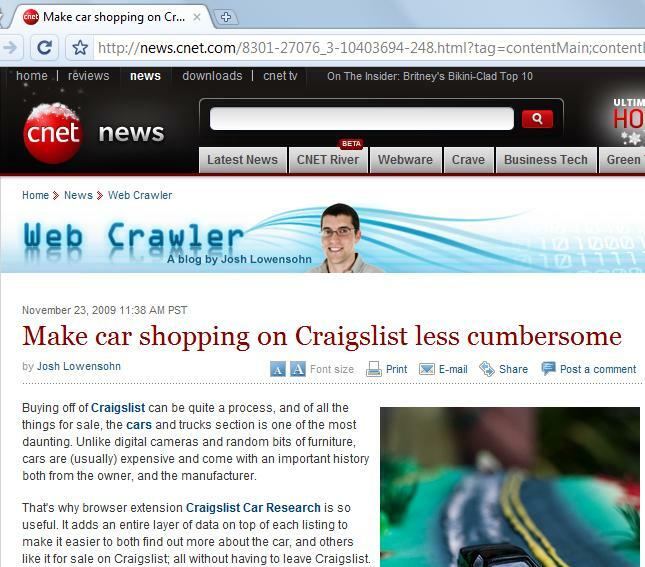 CNET news of http://www.download.com reviewed and published about my browser extension for Craigslist. 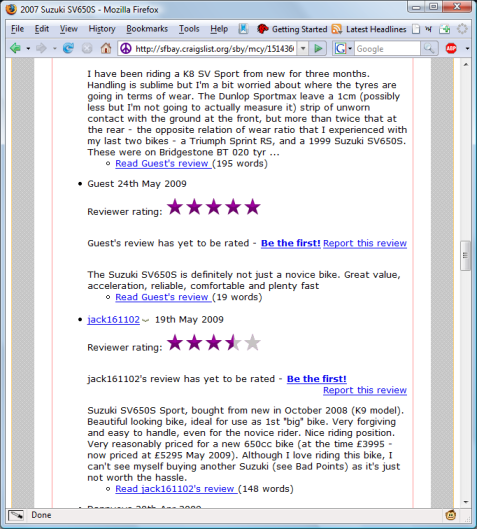 Shows consumer reviews of motorcycle. This is very useful in finding pros/cons of the bike and also if the vehicle suits buyer. 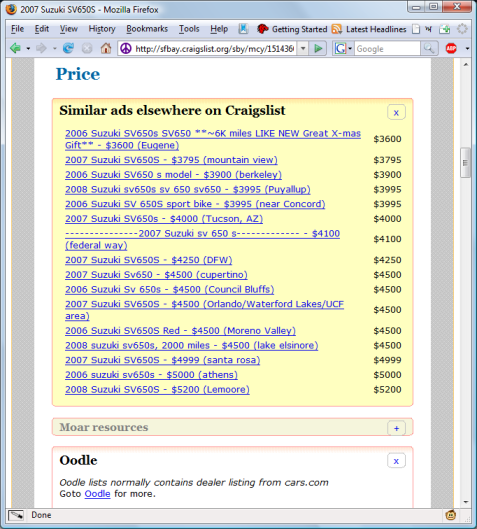 Shows similar ads on top found elsewhere on craigslist and Oodle. This gives idea of market price and general availability. Quick indication of if the motorcycle was dropped or was involved in accident. Quick indication if its a moving sale. Add your Notes to the ads using Recently Viewed list. Shows Factory Recalls. Gives idea of manufacturing defects etc. Also when buying make sure to ask original owner if the factory recalls were done. Shows TSB (Technical Service Bulletin). The service information/updates issued by the manufacturer. If a phone number (US/Canada) is mentioned in the ad then it creates a link on page which lets one easily search craigslist for other ads posted by the poster. Motorcycle review at Review Centre by owner of motorcycle. Same make / model motorcycle ad listing from Craigslist. Motorcycle listing from Oodle below Craigslist motorcycle ad. * Support for motorcycle sale sections of sites Advrider, BCSportBike and motorcycleforum. * Support for eBay and Kijiji (US). * Fixed a bug that sometimes caused unresponsive script popup. * Enhanced feature-block collapsible functionality. * Added ability for user to specify ‘year’ and ‘make’ of motorcyle if its not automatically recognized by the extension. * Major change in the layout. * Did some code refactoring and renaming.